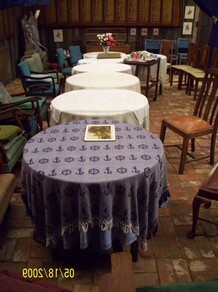 The restaurant section of the museum has seating for up to 40 people and is available for functions and events. An integrated audio-visual system is also available. The restaurant houses a first world war "Red Rattler" train carriage that has been converted to a kitchen. Covered barbeque facilities are also on-site and rest room facilities have wheel chair access. 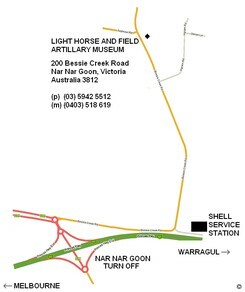 The Light Horse and Field Artillery Museum is located approximately 40 minutes East of Melbourne on the M1 freeway. Surrounding places of interest include the Serendipity Lavender Farm, Gumbya Park, and The Garfield Picture Theatre & Function Centre. See our download section for a downloadable map to the museum.